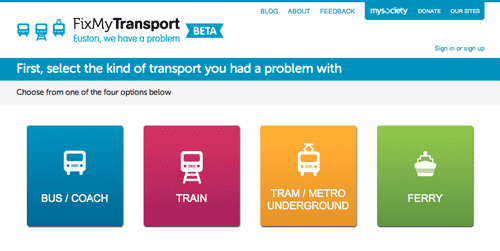 When a user on FixMyTransport tells us about a journey they’ve had, we ask them if it was on a bus, train, underground, or ferry. This is a simple question, but of course our lead developer Louise thought carefully about how to ask it. As programmers, we sometimes approach collecting data from the user just like filling in a form — a paper form. So, we could ask the bus/train/ferry question by using a list to select from (in HTML, that’s a select tag) — perhaps spread out, or as a drop-down list — or maybe as a set of radio buttons. But in this case we have deliberately broken away from idea of the form. Effectively, this means we have a whole webpage devoted to one single question. That’s perhaps not what you’d expect if you’re building an online form. Often it seems easier not to break a task across several pages. But here we have a single page with a single question on it. This page has been very successful. We know this because we study our web analytics (that is, how people use our sites) as well as running usability testing. It’s true to say nobody gets stuck on this page, nobody drops out, and in fact most people don’t even think about it (that’s the “reasonable” thing, above). After the latest session of FixMyTransport usability testing, run by our developer Mark, we had a discussion with other team members. We agreed this was one of our favourite FixMyTransport pages. It’s pretty, it does the job, it moves the user forward (see the earlier blog post about “why the FixMyStreet homepage asks one easy question”)… and best of all it shows that some of us were wrong to be cautious about introducing another step into the problem-reporting process. Incidentally, Mark recommends the book Rocket Surgery Made Easy if you’re interested in running your own usability tests. In summary, sometimes a super-simple choice is strong enough to be presented as a single webpage all by itself. Don’t fall into the trap of thinking web forms should be like paper forms.